Exhibition from June 22-2018 to 2021. 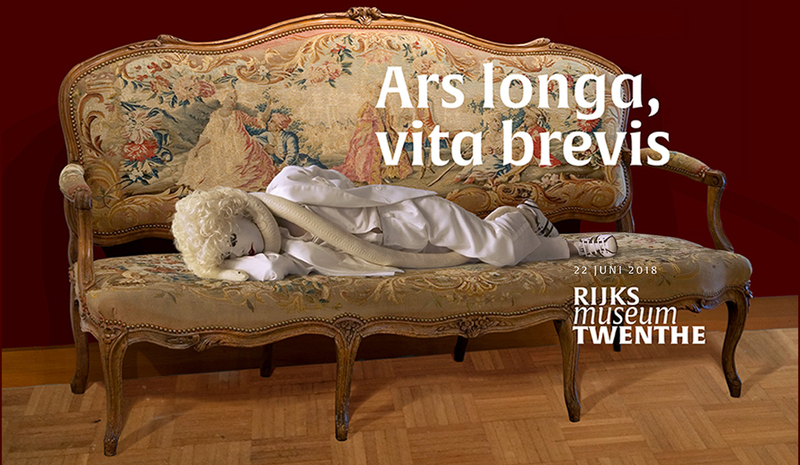 Ars longa, vita brevis (‘art is long, life short’) is the new collection presentation of Rijksmuseum Twenthe, with the central theme ‘the human condition’. Nine successive cabinets in which the artists tell the story of ‘La condition humaine’ with their installations, the human condition in the 21st century. The nine artists are Bart Hess, LA Raeven, Berend Strik, Philip Vermeulen, Anne Wenzel, Peter Zegveld, Karin Arink (in collaboration with Renée Kool), Armando and Silvia B. 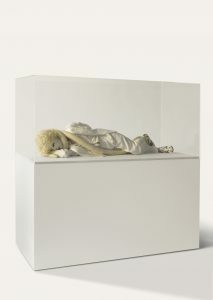 Their installations follow the different phases from a human life, starting with ‘desire’ in the first room and ending with ‘memento mori’ in the last room. The boy on the couch fits in perfectly in this picture, as innocent and beautiful as he is. A contemporary dandy, in his pristine white suit with perfect cut. He is taking a nap in complete satisfaction, or is he not? Where with Armando the torning is immediately tangible, it reveals itself with Silvia B. only in the second instance. Slowly cracks appear in the polished surface. The python around the neck, the playing card in the pants. Has this young fool fallen for the temptations around him and succumbed? On his ankle the figure 777 is tattooed. According to some, this figure refers to divine perfection, the perfect state of man before the Fall. When he was still a unity with God and the evil did not yet exist. A condition in which death was not yet present. Le Fou was purchased on this occasion by the museum. Now the complete series Les plus Beaux, part II is in collection of Rijksmuseum Twenthe.